This lovely candle bowl is simple to do and very elegant when displayed. It will make a lovely addition to any holiday table and is low enough for conversation too. Stain the candle cups the color of your bowl, (or both to get the best match). Allow to dry. 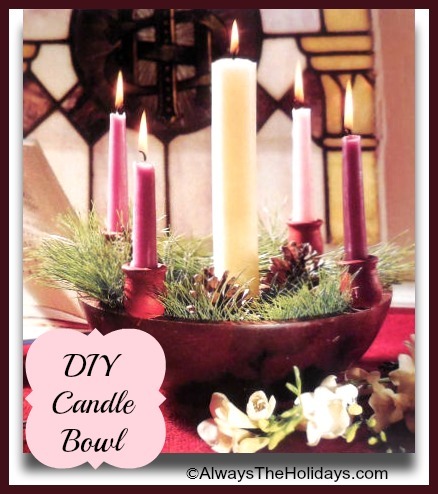 Using hot glue, attach the candle cups to four areas of the bowl and let them set. Lightly spray the edges of the pine cones with aerosol snow and let dry. Place the Medium sized pillar in center of the bowl. Surround it with some fir greenery and place the pine cones around the candle. Insert the small pillars into the candle cups. Light and enjoy.